At Modern Digs, we understand the importance of a comfortable, beautiful bedroom. Often times your bedroom can be your only refuge in the midst of a hectic schedule. You want your room to be an escape - something you can get away to. That's why Modern Digs has everything you need to create a cozy, modern bedroom suite. Not only will your bedroom look great when you use our modern bedroom pieces, but it will also have a relaxing atmosphere... the perfect place for a restful night of sleep. Start transforming your bedroom by browsing our selection of fashionable beds, then add a modern dresser and contemporary nightstand. Add a chest of drawers to maximize storage then complete the look with accessories. Modern Digs even offers modern wall art, the latest lighting, and contemporary area rugs to add the finishing touches to your bedroom. We search the globe for affordable modern bedroom furniture and then bring you the latest styles and designs at the lowest possible prices. In fact, we back every item we sell with our Best Price Guarantee. There's no need to wait for special sales or promotions when you already know you're getting the best deal around. Whether you need a cool platform bed for your teen or a complete modern master bedroom suite, you can rest assured you won't find a better deal on modern contemporary bedroom furniture. Modern Digs is your one-stop shop! A classic approach to creating your perfect contemporary bedroom is going minimalist. When less is more. We're talking a design that is clean and simple, resembling Italian modern. Picture white walls and striking mod furniture accented with pops of color within your area rug and artwork! Guests will be drawn in immediately and you will find peace with fewer objects and more mental clarity. You can achieve this look using Modern Digs exhaustive catalog of contemporary bedroom furniture. 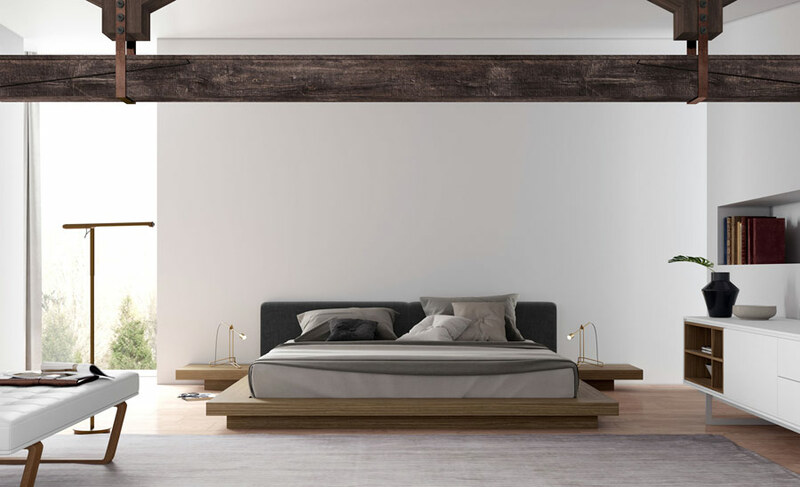 To create your ideal bedroom, we recommend starting with one of Modern Digs' modern bed frames. Each of our modern bed frames has clean lines that may look simple but really pack a punch. There are so many possibilities that it might seem overwhelming, but here's a good rule of thumb to follow: if you don't have the best eye for design, consider the contrast the bed will add. The bed is usually the focal point in a room, so it is best to choose a bed frame that contrasts your walls to really make it pop. If you have white or light-colored walls, choose a darker colored bed frame. We offer beds in rich espresso, classic walnut, or stark black. On the other hand, if you've already painted your walls a darker color (and intend to keep them that way), choose a bed frame in a crisp white or a light gray to attract the most attention. Bed frames may seem like an understated design decision, but they hold a lot of power in the bedroom! Our most popular selection is the ModLoft Jane Bed. If you're looking for something simple, we recommend Akita - our popular Japanese Bed. Each of them boasts a cool modern shape that makes a statement in your room. Whether you're leaning towards something low-profile and simple or something over the top, you'll be able to find a bed that's perfect for you! Modern Digs offers bedframes is a wide variety of materials to complement different room decors, comfort levels, or personal preferences. We offer environmentally-conscious options like our bamboo beds, so you don't have to feel guilty about your purchase. If you're not quite sure how to create your ideal modern bedroom suite together, make it easier on yourself by selecting a bedroom set. These sets include a bed frame and matching storage solution such as a dresser, nightstand, or even TV stand. By purchasing these items in a set, you get a bargain price and won't have to worry about choosing items that look good together. The hard work is done for you! After you've chosen a bed, start your search for a nightstand. We offer nightstands that perfectly coordinate with your bed frame. If the bed you love boasts a wood finish, finding matching nightstands is usually the best way to go. You can also find a nightstand that adds some contrast. Usually, it's more aesthetically pleasing to choose a contrasting nightstand if you have an upholstered bed to create a cool, distinct combination. Modern Digs offers nightstands with extra storage, so you can keep your essentials carefully tucked away. We also offer simple, classic nightstands that won't take up much space. They are perfect if you just want a nightstand to hard your alarm. Next, assess how much storage you need in your bedroom and what storage solutions will best fit your space. In a perfect world, everyone would have an amazing walk-in closet with built-in cabinets to store everything from shoes to skirts. Every bedroom would be clean with an expansive open-concept-and jaw-dropping bed with an accent chair. But let's get real: our bedrooms all limit us in some way, failing to provide the adequate storage we need to keep all our things organized. With Mod Digs' collection of dressers and chests, you'll get all the storage you need! We have a wide variety of storage solutions to match your personal style. If you need something to supplement your spacious closets, you'll find smaller dresser options that get the job done. But even if you have no closet space at all, you can find one of our super-spacious dressers that will never be overcrowded by your clothes. We offer sleek, tall dressers as well as wider, shorter dressers so that no matter your room's shape or size, you can find an option that fits nicely into your space. Dressers serve a very functional, important purpose but you won't have to choose function over fashion with Modern Digs. Choose from classic designs or the latest trends. Our modern dressers are stylish and highly aesthetically pleasing. Some of our dressers are simplistic with no external hardware like handles or knobs. They will seamlessly blend into your room's decor and don't steal the focus from your bed or any other main focal point. Some of our other options are bold and will immediately grab your attention with their show-stopping beauty. Finally, it's time to add pops of color with accessories like vases, rugs, and artwork. These are inexpensive ways to make a big impact on your room. It's the most fun part of designing your bedroom. Modern bedrooms are usually filled with light. If you don't have much natural lighting, you can easily achieve the same well-lit effect with light fixtures from Modern Digs. If you want something subtle, choose one of our unique floor or tabletop lamps. Some of our lamps have bold asymmetrical lines that make a statement. Others are more traditional looking options. Modern Digs also offers modern chandeliers if you want overhead lighting. With sculptures or vases, you can add some extra style to your space. These pieces are available in a variety of colors and materials•perfect for your nightstand, dresser, or coffee table. Don't forget your floors! Changing your carpeting or hardwood flooring is expensive, but with a modern rug, you can alter your bedroom's look with ease. Our area rugs are soft and comfortable and come in a variety of sizes to take up your entire room or a just a portion of your larger room. No bedroom is complete without hanging artwork that conveys your personality. Your space should embody - YOU! Choose from our wide selection of art including abstract pieces, pop art, and beautiful, realistic paintings of landscapes, city skylines, and nature. No matter how much wall space you have, you can find something from Modern Digs that will fit well and add just the right amount of flare. Modern Digs also offers mirrors, clocks, and more to perfectly accessorize your bedroom. Our accessories enable you to change your bedroom's look and feel regularly without having to buy and sell big items like furniture. By just swapping out a few accessories and painting a wall or two, you can have an entirely new modern bedroom! You can find everything you need to complete a luxurious-feeling, contemporary bedroom with Modern Digs. Whether you have an eye for design or are unsure how to compile your dream room, our catalog of modern bedroom furniture makes creating your ultimate bedroom effortless. If you're building a bedroom from scratch or even if you just want a few new items for your bedroom, Modern Digs can ensure your perfect bedroom becomes a reality. Get access to the very best modern bedroom furniture with Modern Digs. As always, please don't hesitate to email or call us with any questions! Modern Digs would happy to help you design your modern bedroom and help you select the perfect pieces. 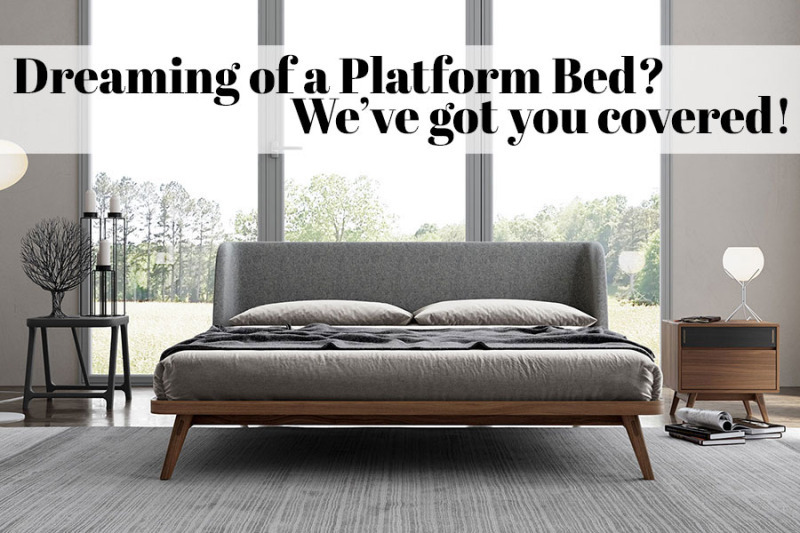 Your complete guide to our best modern platform beds. On sale now, you'll love our stunning Azara bamboo bed frame! 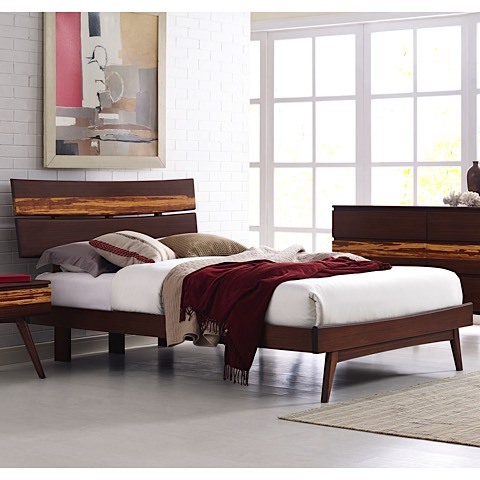 And don't forget to check out featured bedroom styles from ModLoft!